Style Friend ISFJs bring a quiet sense of beautiful industriousness to the world’s they inhabit. Gentle and seeking harmony in their environment and relationships, they never want to be noticed for the “wrong” reasons (or sometimes at all). The Style Friend ISFJ style strengths include the following. 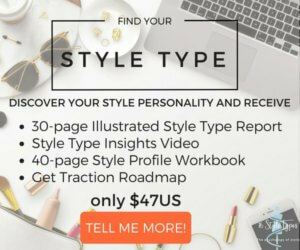 Seeking a consistency in her look – a hallmark of her personality in many areas, not just style – the stylish ISFJ will update her look with new, often subtle, twists. To others, this movement may only be a small step, but to the Style Friend ISFJ it can represent variety on her own terms. Something of a ‘set’ dresser, even changing one small aspect of her ensemble will keep things interesting for the Style Friend ISFJ. Like other SJs, the Style Friend ISFJ has an acuity with details and employing them consistently and methodically. This performs a very necessary function, it gives a needed sense of stability and security. In the style arena, what could be more important than having this most personal part of yourself safe and secure, sold as a rock on a foundation of trusted details? Drawing on their extensive memory banks of what has worked in the past, as other SJs do, the stylish ISFJ is adept at creating coordinated ensembles, often from a not overly huge wardrobe. With her sense of beauty and what’s attractive, something other Feeling Types share, she’ll be able to put this with that and create a lovely outfit that supports her as she goes about her day. Other SJs like to know what the guidelines and protocols are in important areas of their life, but Style Friend ISFJs are especially keen to understand what the boundaries are. They will deliberately limit their options so as not to cause overwhelm, confusion or “mistakes”, the latter they would walk across broken glass to avoid when it comes to style and how they are dressed. One of our ISFJ reviewers said she would prefer not to leave the house and to miss the party if she didn’t have the right ensemble for it. Wearing the right outfit is that important. I had a closet full of clothes but nothing I wanted to wear. Of course this was 30 years before 7s2s.